Pest control is most often associated with chemical control with pesticides, or non-chemical control through traps and deterrents. In addition, today's pest control focuses on complete Integrated Pest Management programs that include inspection, exclusion, and sanitation along with chemical control where needed. There are other methods of natural pest control that aren't always highly publicized or discussed. That is, encouraging natural predators to do the dirty work for you. Animals, such as cats and barn owls naturally prey on rodents, dogs can sniff out bugs such as bed bugs and termites, and birds are natural and beneficial insect predators. Although these predators will rarely provide a complete control method, they can help to keep populations down. 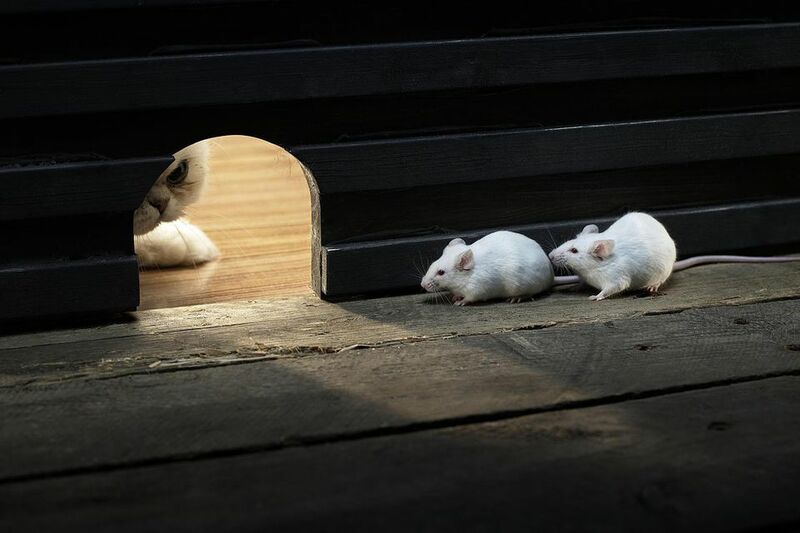 Since cats prey on mice, gophers, rats, and other destructive rodents, they can provide help in controlling these pests. To utilize the natural tendencies of these animals and protect some cats from euthanization, programs are being developed across the U.S. to encourage adoption of feral or barn cats for such efforts. One program is the Barn Cat Program of Lodi Animal Shelter in California. The shelter encourages the adopting of feral cats by residents or businesses that meet specifications to assist with the control of rodents on their property. Another organization in California, the Voice for the Animals Foundation has developed a Working Cats program that "relocates sterilized and vaccinated feral cats who would otherwise have been euthanized at the shelter to places that have problems with rats." The organization has placed cats at stores, campuses and police divisions, and has seen great success in keeping rats away because rodents are repelled by cat odor. In the recent reemergence of bed bugs, bedbug-sniffing dogs have become a key tool in the fight against the rapidly spreading populations. The dogs go through a training program, similar to that of police dogs, but learn to sniff out bedbugs instead of bombs or drugs. Similar programs have also been developed for the sniffing out of termites. The dogs are used by many pest control companies in their inspection efforts, as they are said to be quicker and more accurate in finding the bed bugs where they hide. This can save the homeowner a great deal of money because if even a single area of bed bugs remain, a population can quickly regrow. Another natural predator used in the Lodi District of California is the barn owl. The Barn Owl Headquarters, a company specializing in natural methods of controlling rodents, birds and some species of flying insects, provides barn owl nesting boxes to attract the owls to sites needing rodent control. The birds are attracted to snug, dark cavities and will tolerate a fair amount of noise and commotion around their nest as long as they are not directly threatened. "While the food supply remains dependable, the owls will return season after season," the site states. However, it adds the caution that "barn owls will not the ultimate solution to a farmer's rodent problems. Instead, they represent one out of many tools a farmer has in his disposal in the fight against these pests." Although some birds are considered to be pests, others, such as song and wild birds, are beneficial to the environment and feed on pest species, primarily insects. As noted in a publication by the Virginia Cooperative Extension, "Creating a backyard environment that attracts birds and other natural enemies of insects and other pests helps control these pests on desirable plants." Just a few of the pests that birds will feed on are grasshoppers, webworms, slugs, snails, and some moth species.